today we want to show you a highly effective warm up routine that will take your team to new heights! ‘Movement Preps‘ are a simple but efficient way to prepare your team for the next match. Learn how to warm-up effectively before every practice and every game with these dynamic drills. They have specifically been designed for soccer players. Movement Preps get you and every important muscle in your body ready for action. The first exercise is called “The hand walk”. We start off with our legs parallel to each other, now we move our fingers to the ground. While moving your fingers forward, make sure that your knees stay extended in order for your hamstring muscles to be stretched dynamically. Next, perform a push-up to put pressure on your body and then move back towards your arms with your feet. Try to avoid too much swinging in the center of your body. This could be caused by a lack of activity in the core muscles, or by bending your knees, which is caused by a lack of mobility in the hamstring muscles. This activates the hamstring and core muscles, ankles as well as the supporting muscle groups of the upper body. The next dynamic warm-up exercise is called “The forward lunge” including a rotation of the thoracic spine. Start off again with your legs parallel to each other, lunge forward, move both arms down to the lead leg, move the thoracic spine up, keep your eyes on your hand, back down, turn to the other side, move both arms up, and get up again. This exercise improves the strength of the leg’s axis preparing it for possible movements during the game, while simultaneously mobilizing the upper body, and actively stretching your hip and hamstring muscles. 6 to 8 forward lunge reps. Make sure the lead leg remains in a straight line, and not to move it sideways. The next exercise is “The dynamic sideways lunge pushing back into the starting position”. It prepares players for sideways movements during the game. Lift your leg up high, lunge sideways, standing leg remains extended. Now push back dynamically into the starting position. This actively stretches your adductor muscles, as well as improving its strength. Make sure you upper body is upright, don’t bend it forward, so that your leg muscles are working actively. 6 to 8 reps on each side. Head and upper body stay straight throughout. The next exercise especially activates the muscles in the hip region, including the hip flexor, the glutes, and the thigh and hamstring muscles. Start off by actively bringing your leg up; here it’s important to activate the glutes of the standing leg. Grab your foot, then stretch the thigh, while simultaneously lowering the upper body. Move down and up again. While your muscles are being actively stretched, your ankles are also being stabilized, and this prepares you for possible poor pitch conditions. This movement requires you to be very concentrated and fully focused during this exercise. 4 to 6 reps on each side. The team of Unterhaching performs ‘Neuro-Skippings’ before each game in order to neuromuscularily prepare their players for quick motions and movements. Start off in a half squat, move your center of gravity forward, put pressure just on the balls of your feet. Quickly move up and down on the balls of your feet. Continue for three seconds, then stop. Relax for 30 seconds, then repeat. 3 to 5 reps. Move out your upper body, chest straight, forward your center of gravity, then quickly move up and down. 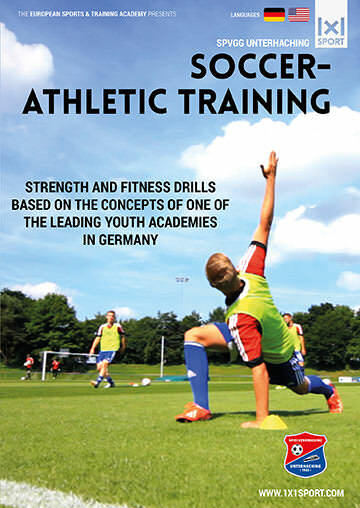 Check out these and more fantastic exercises on “Soccer – Athletic Training” including a bonus 10-station circle training that will allow you to get the most out of your team on a physical level!